IMAGE ABOVE: Caroline Bowman as Eva. Photo by Richard Termine. Caroline Bowman as Eva and Josh Young as Che. Photo by Richard Termine. 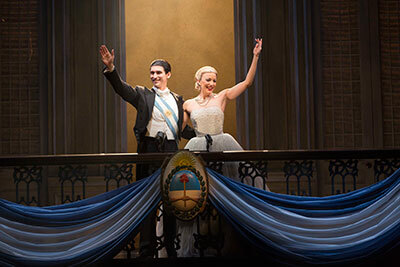 Evita, the Andrew Lloyd Webber/Tim Rice rock opera that took audiences by storm when it debuted in London in 1978, is making its way through Texas, playing at Broadway in San Antonio at the Majestic Theatre through May 4, and at Theatre Under the Stars in Houston, May 6-18. But the real story behind the seemingly Cinderella tale of a girl from the sticks who became first lady of Argentina started much earlier than that. In 1936, a 15-year-old girl came out of the flat, dusty pampas of Argentina into the grim, gritty city of Buenos Aires. Dark-haired and big-eyed, by all accounts she was uneducated and her prospects in the Argentine capital looked dim. What happened next was history, and it might have just stayed there, one more story of a girl from nowhere who married up. Except this girl was Eva Peron. And she wasn’t content to sit on the sidelines of history. The real story goes something like this (and it’s important to keep in mind that “something like this” is about all you can hope for with Evita, since truth and mythology have blended like twin strands of DNA over the last 95 since she was born, no small thanks in part to Evita, herself): she was born Maria Eva Duarte in 1919, the illegitimate daughter of Juana Ibarguren and Juan Duarte. She was the youngest of five children Juana had with Juan, and from an early age, she decided she was special. She excelled at poetry recitation in school, loved the movies of Norma Shearer and was determined to be an actress herself. She hopped on a train to Buenos Aires at 15, managed to land a few bit parts in movies (and nearly all are agreed she was a wooden, essentially terrible actress) and scored a huge role as a radio performer, acting in radio plays about the lives of great women, like Elizabeth I of England and Catherine the Great. 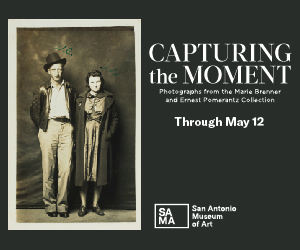 She met Juan Peron at a benefit concert, while he was well on his way to a similar nobody-to-somebody status, having grown up in a far-flung Patagonia hamlet, becoming, by the time Eva met him, a military heavyweight. 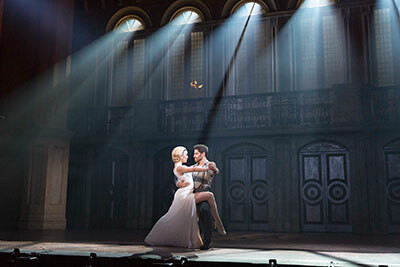 Sean MacLaughlin as Juan and Caroline Bowman as Eva – photo by Richard Termine. Peron married Eva, and the two became the kind of power couple Ferdinand and Isabella might have been, had they lived in the 20th century. Through revolts, strikes, brushes with policies that looked and sounded like communism, Peron and Eva controlled Argentina with much more iron fist than velvet glove. Harboring a life-long resentment of the middle- and upper-class society that was fueled from her childhood, Evita became a self-described Lady of Hope for the working classes, giving away money, scholarships, bicycles, even houses through her office at the Ministry of Labor. When Evita died at 33 in 1952, the country went wild with grief, mourners waiting for days in the pouring rain to view her body in repose and stacking flowers 20 feet high against the walls of the Ministry of Labor. If it all sounds like the stuff operatic dramas are made from, you’ll readily understand what so attracted Andrew Lloyd Webber and Tim Rice to the story, and how it became their third collaboration together. They weren’t the first people to dramatize Evita’s story (there had been two plays and a film before they ever got their hooks into her), but theirs is undoubtedly the drama that lasts. 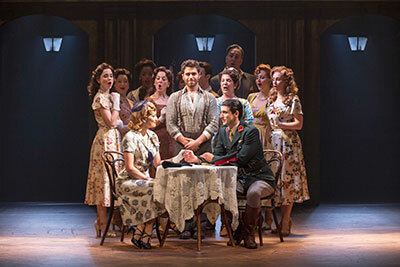 Josh Young as Che and touring cast of Evita – photo by Richard Termine. From its debut in London in 1978, and on Broadway a year later (where it would clean up in the Tony Awards of 1980, winning nearly every major category), it captured the imagination of audiences across the globe. A show that’s both reverential to its central character, offering her the haunting “Don’t Cry for Me, Argentina,” as well as deeply critical, as seen in the opening number “Oh, What a Circus,” or the sexual-tension-fraught “Waltz for Eva and Che,” it blends history and fancy in grandiose style. By the time Madonna fought – and won – her own epic battle to portray the Argentine first lady in a big-screen adaptation of the musical in 1996, the show had seen multiple U.S. and international tours and productions, and was on its way to a 2006 London revival. 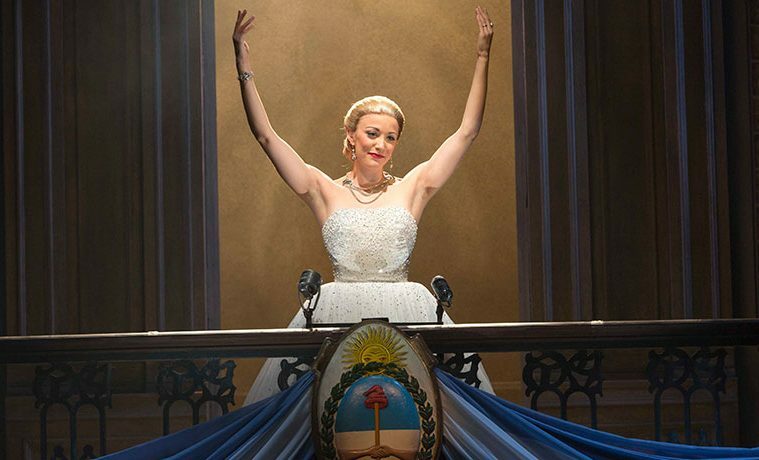 Broadway revived Evita in 2012, and a road show of that production is now making its way across the U.S., with stops in San Antonio and Houston on its itinerary. Caroline Bowman makes her role debut as Eva, Josh Young sings her critic, Che, and Sean McLaughlin is her husband, Juan Peron. Opening in Houston on May 6, Bowman says she’s thrilled to be part of the production and that she’s just hitting her stride in the role after eight months in rehearsals and on the road. 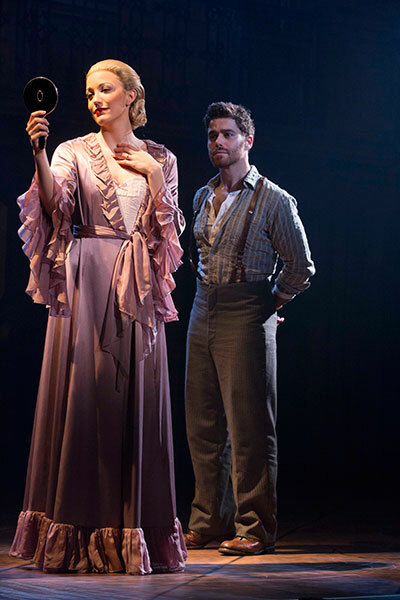 Caroline Bowman as Eva and Josh Young stars as Che – photo by Richard Termine. Bowman knows that even as Eva was a real person, this is theater, not documentary. She spent time researching Peron’s life to gather bits of biographical data that may not have made it into the script, honing in on small things, like the way Juan Peron said that when he first met Eva, she never stopped fidgeting. She’s also honed in on the fact-versus-myth conundrum that everyone from scholars to dramatistsn runs up against when trying to get a clear picture of Evita. Over the years, multiple records have been altered or outright lost, and Eva’s own memoirs have been the subject of debate over whether she actually penned them or not. 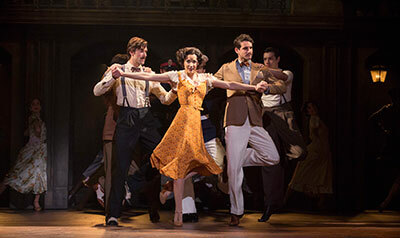 Caroline Bowman in Evita – photo credit Richard Termine. Bowman says it’s hard not to be fascinated by Eva’s rise to the top, no matter what you think about her tactics or her politics. “Hollywood couldn’t write this,” she laughs. 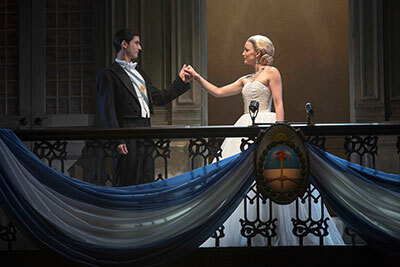 Sean MacLaughlin stars as Juan Peron and Caroline Bowman stars as Eva Peron – photo by Richard Termine.